In a previous post I raised the question of whether biathletes might be more likely to shoot clean (i.e. hit all five targets) if they have just shot clean at their most recent trip through the shooting range. I left off with some numbers that suggested this was the case, but they were aggregated over all athletes. So when we conditioned on ‘shooting clean’ we ended up with a group of skiers that were simply better shots. What we need to do is calculate these probabilities for each individual athlete. Depending on the type of race, the sequence of shooting stages may be one of Prone-Standing, Prone-Standing-Prone-Standing or Prone-Prone-Standing-Standing. Because of that last point, we can’t simply look at the probability someone shoots clean given that they just shot clean, since it will make a big difference depending on whether that sequence of stages is Prone-Standing, Standing-Standing, etc. For instance, the Prone-Standing conditional probability represents the proportion of times that that athlete shot clean at a standing stage when their previous shooting stage (within that same race) was prone and they shot clean there as well. The four panels correspond to the four possible sequences of shooting stages. Each dot represents a single athlete. In each panel, the x-axis represents the overall, unconditional probability of shooting clean prone (top) or standing (bottom). 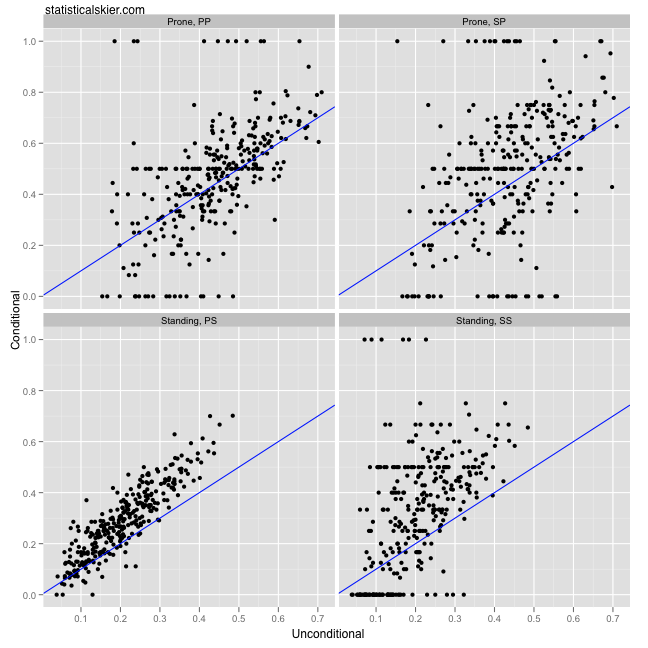 The y-axis in each panel represents the conditional probability for the indicated sequence (PP = Prone-Prone, etc.). If shooting clean in one stage had no effect on shooting clean in the next stage, all the dots would lie on the blue lines (i.e., they’d be equal to the unconditional probabilities). The closest we get to that conclusion is in the PP panel (upper left), where the points seem roughly evenly scattered around the blue line, although perhaps there are more above it. The horizontal banding you see in the PP, SP and SS panels correspond primarily to athletes who had small numbers of those particular shooting transitions. Fifty races doesn’t assure an equal number of shooting transition combinations in all cases. So if someone has done very few races with a SS sequence of shooting stages, the probability estimate for them will be fairly crude, leading to lots of 0’s, 1’s and 1/2’s. The bottom two panels are particularly interesting. They appear to show that there is a noticeable effect of shooting clean previously on shooting clean while standing. And on top of that, the effect appears to get larger as the athlete’s overall skill at shooting increases. Recall that as we move right on the x-axis, we’re moving towards skiers who are generally more accurate, and shoot clean more often. Those points appear to be further above the blue line! This would suggest that a biathlete is more likely to shoot clean standing if they just shot clean (prone or standing), and that this effect is somewhat larger the better shot you are overall. Posted by Joran on Friday, August 5, 2011, at 6:00 am. Filed under Analysis, Biathlon. Tagged Analysis, biathlon, clutch, probability, shooting, World Cup. Follow any responses to this post with its comments RSS feed. You can post a comment or trackback from your blog.